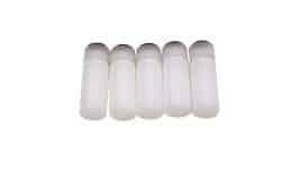 Produktinformationen "pH Storage Bottles (pkg of 5)"
These are the same bottles in which the pH Sensors are shipped. Use them to make mini-beakers for our microscale titrations, or to simply replace the storage bottle. Weiterführende Links zu "pH Storage Bottles (pkg of 5)"
Garantie(Jahre) "pH Storage Bottles (pkg of 5)"
Weitere Info "pH Storage Bottles (pkg of 5)"
Kundenbewertungen für "pH Storage Bottles (pkg of 5)"